Thanks to their schooling and to the broader culture that surrounds them, American children become familiar with a rather contradictory characterization of their country. They're encouraged to see it as both a benevolent, freedom-loving nation and as a "superpower." What in the world, some kids might wonder, does America do with all of that "power"? Some of these children grow up to realize that America does a lot with that power, much of it in its own, abusive self-interest. 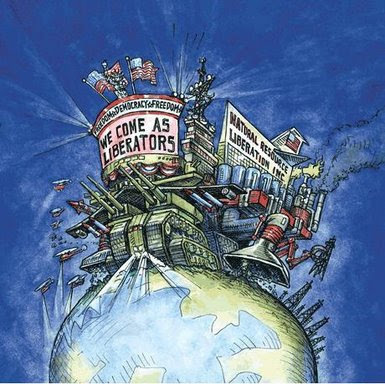 However, despite the awareness that some Americans have of their country's global abuses, very few think of the United States as an "empire." In my experience, using that word to describe their country strikes most Americans as bizarre. American children usually gather that the word "empire" has old-fashioned connotations, bringing to mind such former empires as those of Rome, Spain, and England. Empires, we're told, turn other countries into colonies, and their people into slaves, all for the selfish, resource-grabbing benefit of those in the central, ruling country, the "seat of empire." On the other hand, teachers and textbooks say, America began its very existence in resistance to colonial subjugation. And when America later exerted its military might overseas, it did so primarily to defeat the empire-building efforts of other nations--such as Germany, Japan, and the Soviet Union--and not to further its own imperial ambitions. Few Americans now doubt the claims that their leaders have always made on this subject, that when America intervenes overseas, it does so reluctantly, and because it's a democratic, "freedom-loving" nation. Most hear nothing wrong with comments like this one, by former Secretary of Defense Donald Rumsfeld: "We don't seek empires. We're not imperialistic. We never have been." American children do usually learn that America has a long and steady history of aggressive involvement, military and otherwise, in the affairs of other nations, especially in two World Wars. However, the general impression they gather is that because America is a benign force in the world, these interventions are always driven by the purely altruistic motive of spreading freedom and democracy. More recently, America is thought to have been drawn into its first war with Iraq, led by the first George Bush, because Kuwait needed our help after Saddam Hussein invaded it. George the Second was thought to have justifiably invaded Afghanistan because it was sheltering the mastermind of the 9/11 attack, Osama bin Laden, and the second war with Iraq supposedly started because Hussein was somehow threatening his neighbors and America with hidden weapons of mass destruction and plans for nuclear weapons. Many Americans now realize that the recent claims about Iraq were false, and that their country acts on its own interests in that "region," especially energy interests. But since Saddam was so easy to portray as a dictator who "gassed his own people," the current conflict in Iraq is still seen by many as a defensible demonstration of America's freedom-loving, democracy-spreading intentions. And as with the ongoing American efforts in Afghanistan, that conflict is certainly not widely understood as the racist, resource-grabbing attempt of an empire to permanently occupy and control another country. That American efforts in both countries aren't going well is attributed not to general, justifiable resistance to U.S. occupation and control. Nevermind, we're led to think, that American forces toppled the governments of those two (and many other) countries, and is currently building permanent bases in both countries, and is thus "occupying" them instead of fighting a war with them. Those two conflicts remain, in the minds of most Americans, "wars," and in the minds of many, noble wars, because again, we're spreading freedom and democracy. Aside from this common delusion regarding American beneficence, two other elements in the general American identity help to explain both the spread of American empire, and its general denial--white supremacy and Christianity. From at least as far back as the Spanish conquests of indigenous people, to the current so-called War on (Arab/Muslim) Terror, leaders have justified their conquests of other people by convincing their populations (and often themselves) that darker people with desirable land, resources, and labor were inherently inferior. Today's American children are routinely taught that their country's vague, almost organic movement westward in the mid-1800s was called "Manifest Destiny," but they're rarely taught that achieving dominion from coast to coast was openly thought of at the time, and labeled, as the destiny made manifest of the superior white, "Anglo-Saxon" race. That racist national identity made it easier to basically steal enormous amounts of land from Native Americans, and from Mexico. Despite the country's ever-increasing racial diversity, the word "American" has continued to register as "white"; as a result, the current deaths of, by some estimates, a million or more Iraqis and Afghans, would be less easy for most Americans to stomach if the dead were less dismissible, as somehow less than fully "civilized" and human, because they weren't white. The story we tell ourselves goes something like this: Other nations throughout history have acted out of greed and self-interest, seeking territory, wealth, and power. They often did bad things in the world. Then came the United States, touched by God, a shining city on the hill, whose leaders created the first real democracy and went on to become the beacon of freedom for the rest of the world. Unlike the rest of the world, we act out of a cause nobler than greed; we are both the model of, and the vehicle for, peace, freedom, and democracy in the world. Many people outside of America, and a few of those within it, recognize the common American conception of their country's place and actions in the world as not only childishly simple, but also flatout wrong. As Jensen also writes, "This is a story that can be believed only in the United States by people sufficiently insulated from the reality of U.S. actions abroad to maintain such illusions." I think an empire can be defined quite simply, as a country that controls other countries for its own gain; that country needn't openly declare itself an empire in order to be one. Aside from using various covert and overt methods to install foreign leaders who are friendly to American "interests," the U.S. exerts various levels of self-interested control over other countries with military might. America currently has over 730 foreign military bases and 2,500,000 overseas personnel, spanning across more than 130 countries. The U.S. has bombed 22 other countries, and that's after the Second World War. It also manipulates the politicians and economies of many countries, in many ways. Knowing such things about the U.S. makes it tough to think of it as merely one country among many, instead of as an empire. Nevertheless, Americans continue to delude their children by teaching them that their country is exceptional, and only in good ways. They're led to believe that "Number One!" means the best, instead of the most dominant and abusive. By teaching our children this way, we not only render them delusional; we also rob them of a realistic understanding of their place in the world, and especially of their direct, abusive position in relation to other, less fortunate people. By the way, if you know a child (or an adult) who would could use a more realistic view of America's place in the world, I have a book to recommend. The following video offers excerpts from a great graphic/comic book, Howard Zinn's A People's History of American Empire. This video also offers (as does the book) a concise, accessible summary of America's lengthy imperial ambitions. Brilliant. I always think I'll have a hard time keeping my mouth shut about my future child's History curricula for these very reasons. Lies My Teacher Told Me is a good one, too (for adults. Would love a kid's version). Whadya mean empire? We live in a democracy, silly! Seriously, this failure to teach children the true history of the US and our true role in the world as global bully really bugs. In this vein, parades particularly irk me -- all that flag waving and child inodcrination! Don't even get me started on the 4th of July! Excellent post, as always! Speaking for myself, I didn't become aware of America's Imperialistic ways until my junior year of high school, in AP U.S History. Later, during my college years, I became more informed on just how deep American Imperialism runs in terms of this nation's history. We have basically been building an empire ever since we shook ourselves from the clutches of mother England (Manifest Destiny anyone?). Truth be told, we really haven't stopped being imperialistic (its just that, now it has less to do with guns a bombs and more to do with contracts, trade agreements, embargos, and the like)and as always we ignore the beam in our eyes while we attempt to remove the speck in the eyes of our neighbors. This is a topic that has fascinated me for a long time now. The day before Thanksgiving, I talked to both of my kids about the genocide that unfolded after the Native Americans helped the Pilgrims learn to live in the New World. They didn't like hearing it. It made them sad. But, my son had that look in his eyes he gets when gaps in his under-standing of the world get filled- in or when contradictions in his young mind get resolved. Ironically, I think it is because we live in a democracy that U.S. citizens are incredibly naive about what their government does in their name. Our population must be deluded with notions that our interventionist foreign policy comes from noble intentions to ensure popular support for imperialist actions. Excellent post, Macon. I met all my daughter's teachers on back to school night, and liked them all except her history teacher. Here this was, an honors class, and this silly woman was teaching only from the book. I asked her if she planned to pass out handouts during the year of writings by other historians such as Howard Zinn, and you'd think she was sucking on a lemon. One of my kid's first assignments was truly stupid: it asked them to come up with five ideas slaves could have had to gain their freedom. Well, we know what happened to the Native Americans who resisted. Another jewel was what should freed slaves do to earn a living? My kid got an A for saying "volunteer to stay there and work for free in exchange for food and necessities." This teacher isn't even white (although I suspect she thinks she is); she's a very light Latino and in her 50s. Did I complain? No. The lady's ideas are set in stone which I deduced from her reaction to Zinn's book. She's an old dinosaur and I'm comfortable that the younger group of teachers are generally more open. Meanwhile, I add in a few history lessons in casual conversation, and know that my kid will take some classes in college that will expand her knowledge. As a 9th grader, history isn't even on her list of awesome classes, and that's fine with me. She grew up around the news so she has some idea of the ugly side of the US, and at the same time, the wonderful side too. I think it's very important to never teach one's kid to hate their country; hell, it's all we've got, and a country is nothing w/o people. Good people can make it better. I was almost shocked from commenting after reading your comment about the history teacher. one can blame the school-system or teachers for white American arrogance and "not knowing", but I think this is the convenient way to look at things. Many American PoC seem to have much more awareness and also knowledge about American imperialism and I assume that many of them use the same school-system. Most white Americans would still be "ignorant", a willful ignorance, because they never have to feel the pain they cause to other people, within America or also outside. White Americans can be artificially outraged about injustices without even knowing what they are talking about. White Americans aren't outraged about Iraq because it was an illegal invasion but because it was a failure according American terms. America knows that it is an imperialistic nation and America wants it to be, the superpower with the power to invade every country they think they can gain something from it. Great post, thanks Macon. I do know some people who could use a book like that one by Zinn, and they'll be getting it for the winter holiday. jw, you make a pretty sharp division there between white Americans and American POC--the former all bad, the latter all good. From your position as a white person in Germany, what makes you so sure that you can generalize about American POC like that, and especially, that the word "empire" is common among American POC for describing their country? I'm a white American, so I don't know either, but from what I can gather here, it's not much if any more common among non-white Americans than it is among white ones. >jw, you make a pretty sharp division there between white Americans and American POC--the former all bad, the latter all good. >From your position as a white person in Germany, what makes you so sure that you can generalize about American POC like that, and especially, that the word "empire" is common among American POC for describing their country? The position from outside is often the better informed I guess and also PoC inside the USA are in most cases better informed about America's reality than white Americans. Victims of your system, regardless which way, can't be so blind like white Americans. But yes, Macon also wrote about it and this seems to be a tough thought for many white Americans: That PoC know more about whites and therefore white supremacy than white people. Love the post. I think it is SO KEY to look at our "rosy narrative" history critically. What is even more key is finding out a way to channel REAL information to school children. Haven't figured that one out yet.